I’m often asked when I cater if I offer vegetarian options for non-meat eating guests. 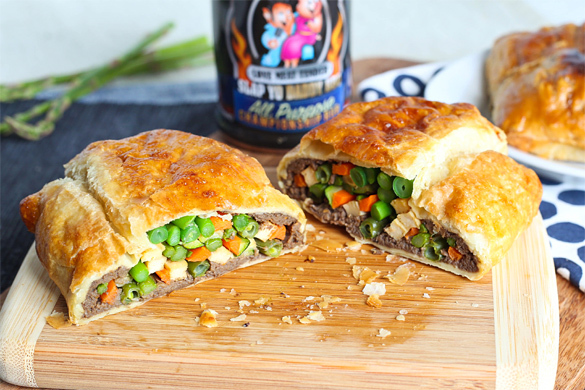 For BBQ catering requests where the host wants knockout options for the vegetarians but doesn’t want them to feel second class at their barbecue soiree, my vegetable Wellington dish always pleases. 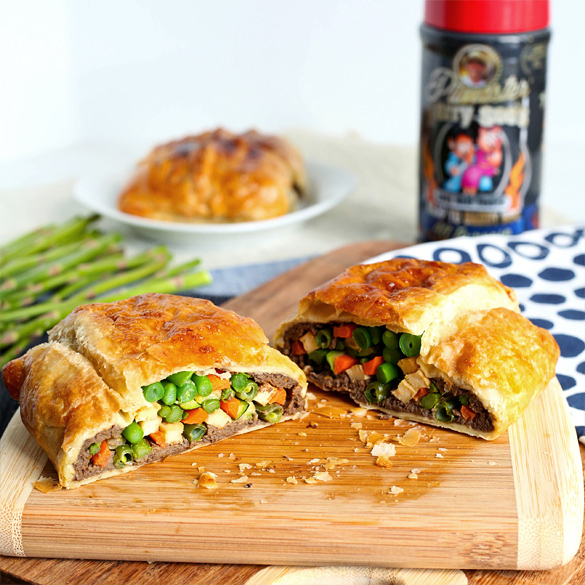 There are plenty of ways to prepare non-protein items in your smoker or grill and my vegetable Wellington makes for a beautiful presentation. It will please not just the vegetarians but the meat eaters also. My idea was inspired by a traditional Beef Wellington except I replaced the beef with vegetables in season. The protein component can be replaced by a legume or by a soy product. In my version, I used lightly fried tofu strips but you could just as well use other forms of vegetable protein. Depending on the season, I use vegetables that I find in my local farmers market. Asparagus, zucchini, squash, carrots, and string beans work well. The vegetables are blanched first which involves quickly pre-cooking the vegetable in salted boiling water and then dipping them into an ice water bath. This preserves the natural color of the vegetables and allows it to hold its crisp texture while it’s cooking in the dough pouch. The technique that really infuses the Wellington with flavor is the savory umami flavor of mushrooms. Mushrooms are sautéed with shallots with a bit of butter and a splash of white wine. It’s then pureed in a blender into a mixture called a duxelle which traces its origin to 17th century French cooking. If you are adverse or allergic to mushroom, feel free to replace the mushroom with some of you favorite grated cheese. I’ve made a terrific variation with some good goat cheese. If you like a spicy finish, you can spice up the duxelle by adding chili flakes, Sriracha, or a bit of curry powder. Another novel idea is to dust the outside pastry crust with some coarse sea salt before you start cooking. A dash of cayenne pepper can also give the crust a spicy nuance and add a bit of color. 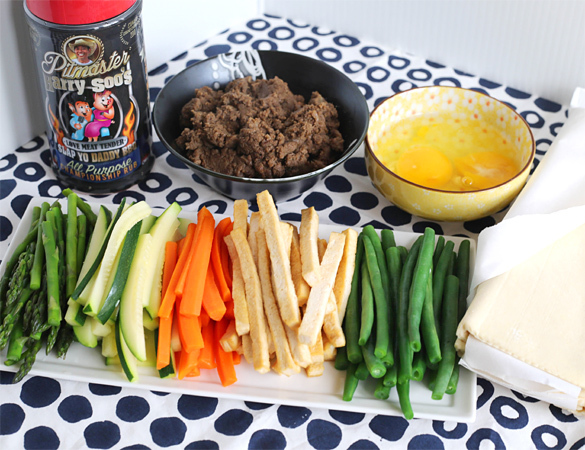 Don’t be afraid to experiment to discover flavor combinations you like. I once did it with some curry powder when I had guests from India and they loved it because everyone asked for the recipe. So, the next time you’re faced with a vegetarian request at your grill party, don’t panic. 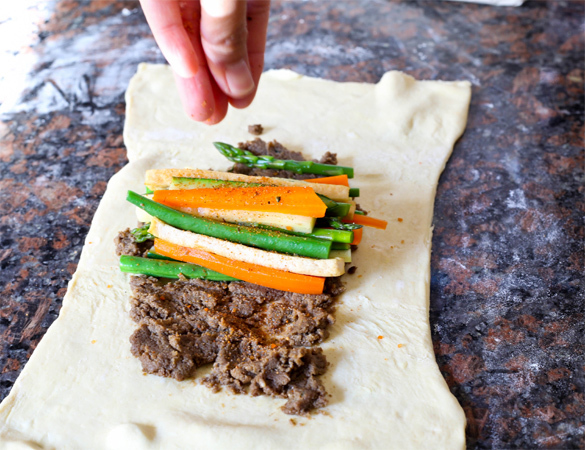 Check out my Vegetable Wellington recipe and make it your own creation with your favorite vegetables. 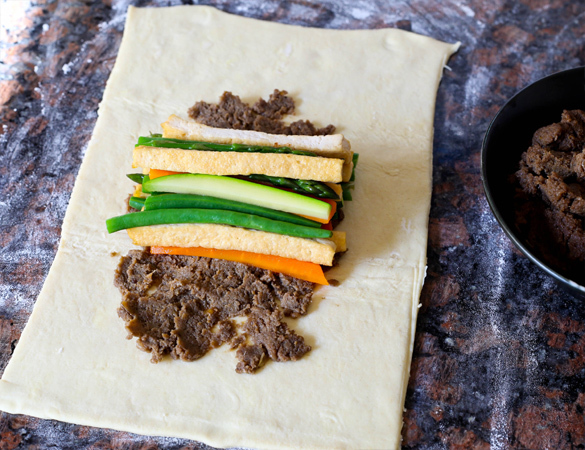 The frozen dough is easy to find in the grocery store and one package of dough makes two Wellington pouches. If you like, you can make a vegan roasted mushroom gravy (recipe included) to serve it with. 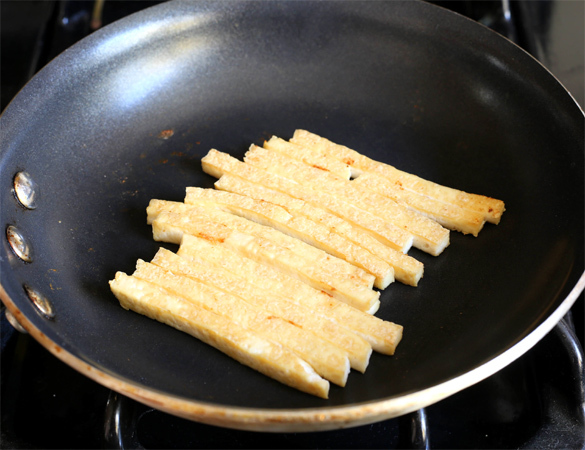 Cut tofu into strips and sauté with a bit of vegetable oil until sides are light brown. Set aside. Separately blanch the asparagus, green beans, carrots, and zucchini. Set aside. Melt the butter in a sauté pan. Add shallots and sauté until translucent. Add the chopped mushrooms. Cook until the mixture starts to turn brown while stirring constantly to prevent it from burning. Add the wine and continue to cook to reduce the mixture so most of the liquid has evaporated. Season to taste with SYD All Purpose rub. The mixture should feel a bit wet and pasty. Set aside. Dust your work counter top with some flour. Carefully unfurl the thawed dough. 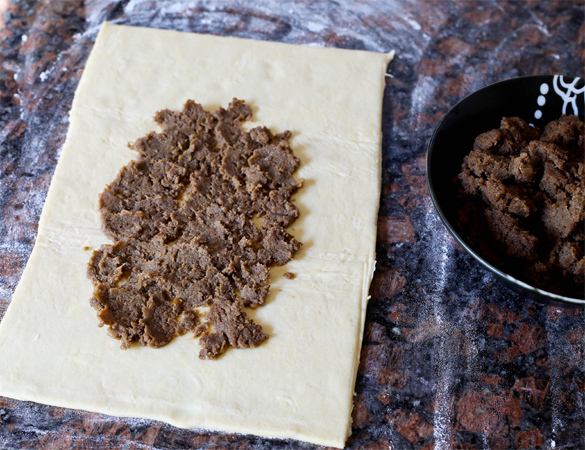 Spread an even layer of duxelle mixture on the dough. Place the tofu and vegetables on top of the duxelle. Dust with more SYD All Purpose Rub. Place the foil pan of vegetables into a 275F pit. I often roast my vegetables when I already have my pit fired up to cook something else. Roast the vegetables in the pit for about 30 minutes to get some smoke and color. Remove and transfer roasted vegetables into a pot. Place the pot on a stove and add 4 cups cold water. The amount of water you add is dependent on how strong you want you vegetable stock to be. Toss in some thyme or favorite herbs you might have handy. Simmer for about 30 minutes. Whip out your propeller blender and puree the broth in the pot (I love my propeller blender but never seem to find occasion to play with it except when making this stock). Reheat the strained vegetable broth and season with salt and white pepper to taste. You can cook further to reduce the stock to the concentration of flavor you like. Mix a corn starch slurry. Slowly add the slurry to the hot broth while stirring with a whisk. The mixture will thicken. Stop when you reach the gravy consistency you like. Remove and keep warm. If you’re process efficient (aka lazy) to make the roasted vegetable from scratch then use regular store bought vegetable broth. It works just as well too. If you won’t tell then I won’t tell. Pour your gravy in a gravy bowl and serve with the Vegetable Wellington slices. Stand back and wait for your guests to ooo and ahhh and ask you for the recipe.